File photo: President Muhammadu Buhari coming out of the plane. 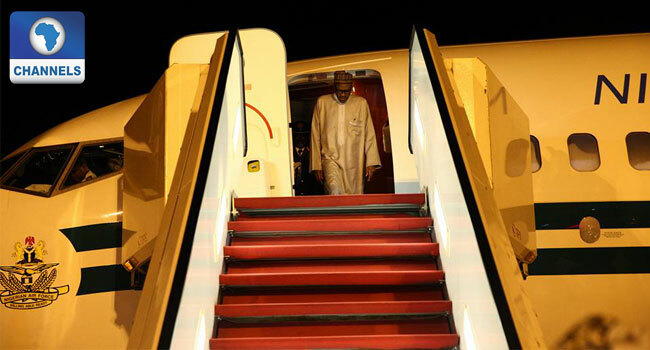 President Muhammadu Buhari on Sunday arrived in Morocco for a two-day working visit. During the stay, he is expected to discuss socio-economic matters affecting Nigeria and Morroco with its King, HRM Mohammed VI. The meeting would also focus on strengthening existing agreements on the fertilizer industry, education cooperation, the Nigeria-Morocco Gas Pipeline project and establishing a basic chemical platform to harness Nigeria’s vast natural gas resources and support Morocco’s diammonium phosphate industry. President Buhari was accompanied on the trip by the governors of Ebonyi and Jigawa states, David Umahi and Badaru Abubakar, as well as other senior government officials. The Presidency had informed Nigerians about President Buhari’s visit, saying it was at the invitation of King Mohammed, following prior engagements in December 2016 when the Moroccan leader visited Nigeria. In a statement on Saturday by the Senior Special Assistant to the President on Media and Publicity, Mr Garba Shehu, they revealed that 14 plants have been revitalised so far under the Presidential Fertiliser Initiative (PFI); with a total capacity of 2.3 million MT of NPK fertilisers. The presidential aide had explained that the feat was a result of the signing of a collaboration agreement between both countries in December 2016 to revive the fertiliser blending plants abandoned in Nigeria.